The Battles of the Lys marked Ludendorff's final attempt to counter-attack and break through to the Channel ports. The following is an extract from "A Short History Of The Great War" by Albert Frederick Pollard. 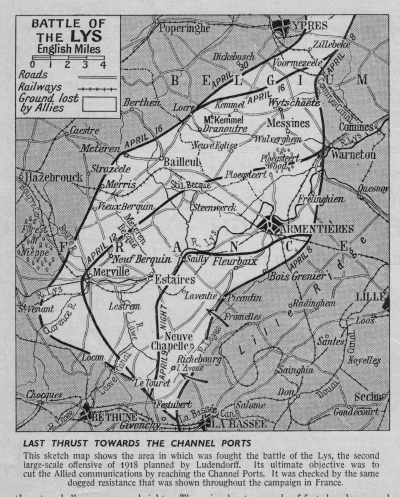 Anticipating some such attack, Haig had deemed it wise to relieve the two Portuguese divisions which held part of the front between the Lys and La Bassée of their arduous responsibility; but he could only replace them by weary British divisions, and the change had only been half effected when, on 9 April, Ludendorff's attack began after the usual bombardment with gas and high-explosive on the 8th. The Portuguese broke fairly soon, the British flanks on either side were turned, and the whole centre had gone in a few hours. By night the Germans had captured Fleurbaix, Laventie, Neuve Chapelle, Richebourg, and Lacouture, and were on the Lys from Bac St. Maur almost as far as Lestrem. But the key-position at Givenchy was splendidly held by the 55th Division, which set a permanent limit to the German success and prevented it from obtaining anything like the dimensions of the March offensive. It continued, however, to develop on the north. On the 10th Bois Grenier fell, Armentières was evacuated, and the Germans poured across the Lys, taking Estaires, Steenwerck, and Ploegstreet and threatening the Messines ridge. That, too, followed on the 11th, while farther south the Germans secured Neuf Berquin and Lestrem. On the 12th they got into Merris and Merville and advanced to the La Bassée canal, threatening to cross it and outflank Béthune on the north-west. Here, however, they were held up in front of Robecq, between the canal and the forest of Nieppe, and turned to exploit their advantage farther north. By all accounts the British withdrawal was chaotic, which may explain why the letter notifying Harry's death was written by an officer of the Welsh Regiment rather than his own.